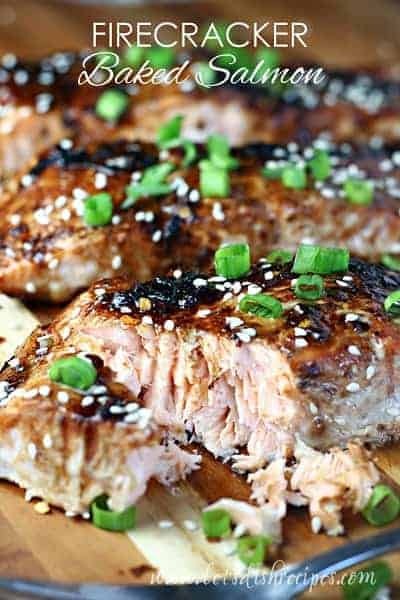 SOY SAUCE AND BROWN SUGAR GRILLED SALMON — Salmon fillets are marinated in a sweet soy sauce mixture, then grilled to perfection in this easy, restaurant quality seafood dinner. 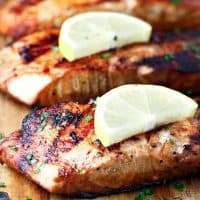 We are huge salmon fans at my house, and this Soy Sauce and Brown Sugar Grilled Salmon is such a simple way to prepare fish, and my kids absolutely love it! Believe it or not, we first tried this recipe for a salmon at a neighborhood block party, and just had to ask our friends from across the street for the recipe. 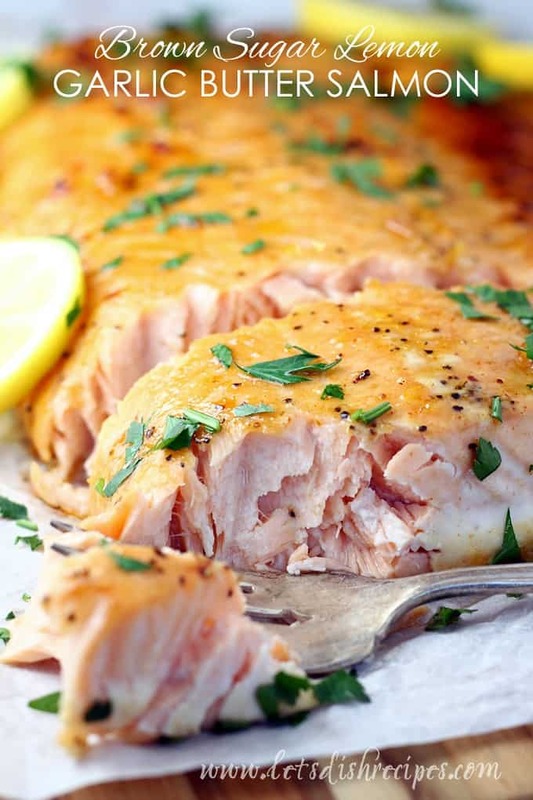 That was almost 15 years ago, and this is still one of our favorite ways to prepare salmon. The soy sauce and brown sugar marinade is the perfect accompaniment to the fish. And I love that it’s made with such simple ingredients that I almost always have on hand. 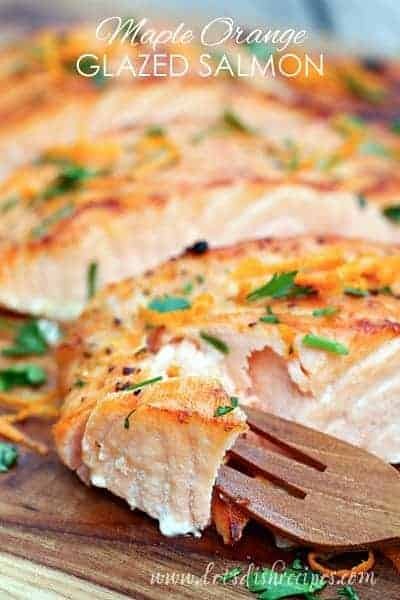 You can use this recipe for pan fried or baked salmon too, but grilling the fish gives it such wonderful flavor, and kind of caramelizes the marinade at the same time. The results are fantastic! I’m not the best at cooking on a grill, (which is why I usually have my husband run the barbecue) so the hardest part for me is getting the cooking time right. Just don’t forget to oil your grill grate before you turn it on! If you’re fish has skin, starting with the skin side on the grill makes the fish easier to turn. If you’re really worried about sticking, rub some extra oil on the skin before placing the fish on the grill. I usually get the big piece of salmon at Costco and cut it into filets. It’s enough fish to satisfy my hungry boys, which I need, because even my child who doesn’t like meat gobbles it up and asks for seconds. We’ve been enjoying this salmon for years. I hope you love it as much as we do! 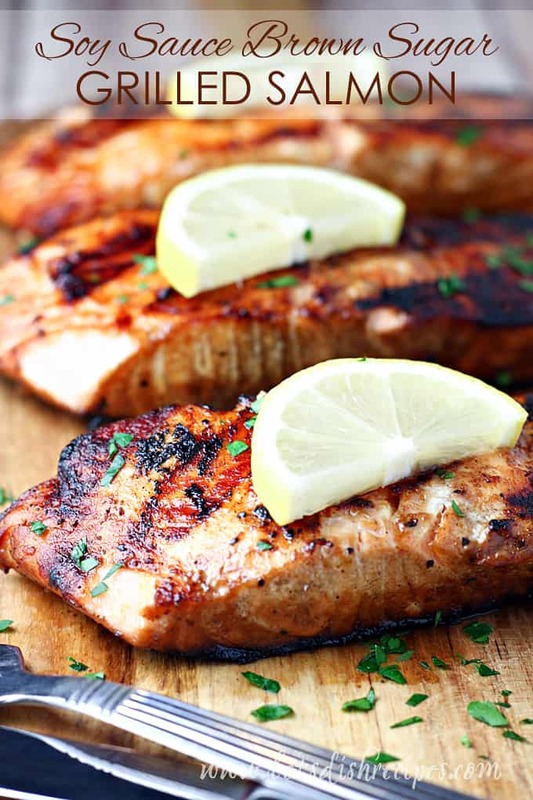 Be sure to save this Soy Sauce and Brown Sugar Grilled Salmon recipe to your favorite Pinterest board for later. Salmon fillets are marinated in a sweet soy sauce mixture, then grilled to perfection in this easy, restaurant quality seafood dinner. In a small bowl, stir together lemon pepper, garlic, salt, soy sauce, brown sugar, water, and oil until sugar is dissolved. Place fish in a large resealable plastic bag. Pour soy sauce mixture over fish and seal bag. Refrigerate for at least 2 hours. Lightly oil grill grate and preheat grill for medium heat. 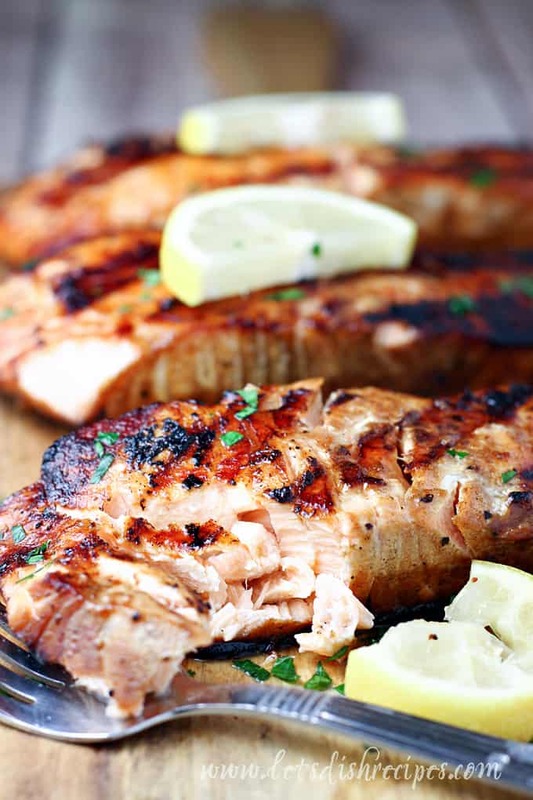 Place salmon on the preheated grill; discard marinade. I may be trying this soon! Easy and simple is the way to go with salmon. i just posted a link here as some of my fav fish recipes! thanks for sharing! My family LOVED this recipe. Even my husband, who is never impressed with fish, absolutely loved it. So much great flavor! future use. It’s a great base (If nothing else) and you’ll love it!